I’m trying to ignore the cyclo drivers but they won’t leave us alone. They’re insisting on pedaling us in their bicycle rickshaws to the boat dock. I’ve told them several times our boat tickets include a free hotel pick-up. I’m looking for our van so we can end this discussion and get out of here. The Hang Chau Tourist Express Boat zips passengers daily between Chau Doc, Vietnam, and Phnom Penh, Cambodia. One of the cyclo drivers is insisting they are our hotel pick-up. I’m not buying his game. I’ve been harangued enough in other cities to know the tricks of those who steer the local budget transportation, whatever it may be. In Saigon, it’s motorbikes. In Bangkok and Vientiane, it’s tuktuks. 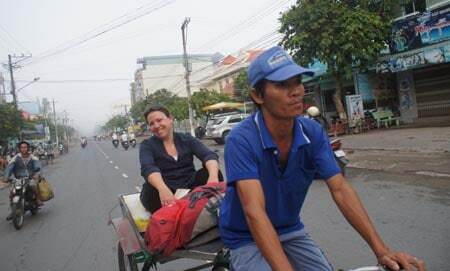 I’m impressed that in Chau Doc, an early-to-bed town near the Cambodian border where a speedboat leaves each morning for Phnom Penh, quiet and environmentally friendly bicycle rickshaws are still the reigning style of chariot for a cheap ride across town. But when it comes to soliciting business, the cyclo drivers are as noisy and aggressive as their counterparts elsewhere. They’ll use any line they can to get you in their seat. I go back inside the hotel to find out where our real ride is. They should know. We’ve bought our boat tickets through their reception. “They are here,” the receptionist says. The 24-dollar boat ride includes a free cyclo pick-up at your hotel. There’s one for each of us – me, my wife, and my mother-in-law. We lurch through early morning traffic and arrive at the boat dock where, after our earlier spat, I decide to tip them the dollar-per-cyclo fare they would have charged if they hadn’t been our scheduled transportation. Fishermen head to work in the early morning haze. Our boat leaves Chau Doc at 7:30 a.m. A feeble sun is filtering through the haze. Fishing boat silhouettes bob in the distance. 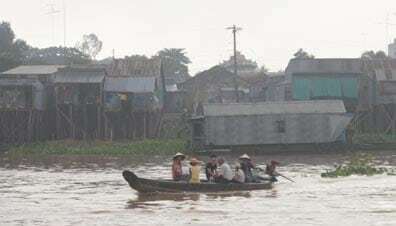 With around 20 other passengers, we buzz up the photogenically murky Bassac River, a Mekong tributary, past wooden houseboats and random factories. Eventually, we join the main branch of the Mekong. A couple of hours later, we’re at the Vietnam-Cambodia border. 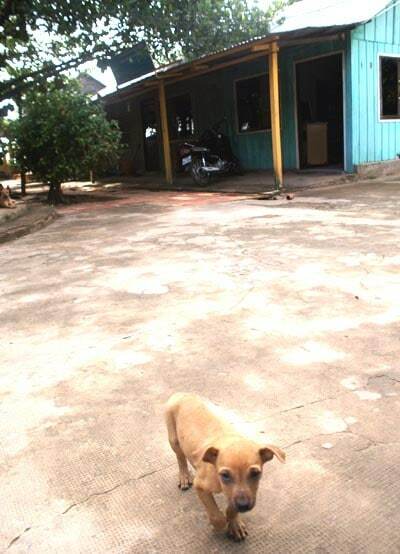 A playful puppy patrols the border at Kaam Samnor, Cambodia. We’re herded off the boat, into a small building, to have our passports scrutinized and stamped out of Vietnam. Once that’s done, it’s a quick ride further to Kaam Samnor on the Cambodian side. There, we hop out again at the most idyllic border crossing I’ve ever seen – complete with a Buddhist shrine, a badminton court, and cuddly border patrol puppies. The sun is shining. Birds are chirping. It’s one of those places where you instinctively take a deep breath and feel your blood pressure dip a couple of relaxing notches. This is a far cry from the image of Cambodia I grew up with. As a teenager in the suburbs of Washington, DC, I had friends who were refugees from the war here. I heard horror stories of Pol Pot’s so-called “Killing Fields” that were so chilling, they gave me nightmares. If you had told me then that one day, I’d be crossing from Vietnam into Cambodia, badminton and cuddly puppies are not what I would have pictured. We relax on a bench for 20 minutes and wait for visas to be pasted into our passports. Then we wander along a grassy path back to the riverbank, back to the boat. We’re in Phnom Penh by lunchtime. It’s my first visit to Cambodia’s capital. I’m expecting a chaotic city – noisy and motorbike-addled like Saigon, only with more intense poverty and a less functional infrastructure. But one thing I’ve learned by now is that it’s natural to have expectations of a place before you arrive – and those expectations rarely click with reality. Tomorrow: Perplexingly Pleasant Phnom Penh. Chao Doc, Vietnam, has a lively night market and riverfront. It’s a fun place to spend a night before catching the early morning speedboat to Cambodia. 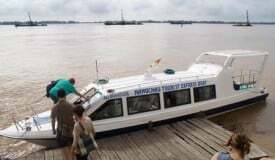 The boats, operated by Hang Chau Tourist, depart at 7:30 a.m. and take about five hours to Phnom Penh. In July, 2012, we paid US $24 per person for the one-way journey (including the cyclo ride). 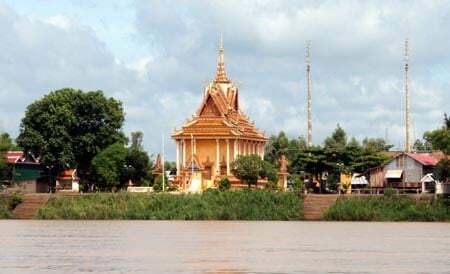 Buddhist temples dot the riverbank on the final stretch into Phnom Penh. Tuktuk drivers will also try to talk you into hiring them for the entirety of the following day – sometimes worthwhile, though you might prefer to get your bearings in the city before committing. Just be prepared for some sulking from your driver when you turn him down. It’s part of the sales pitch.